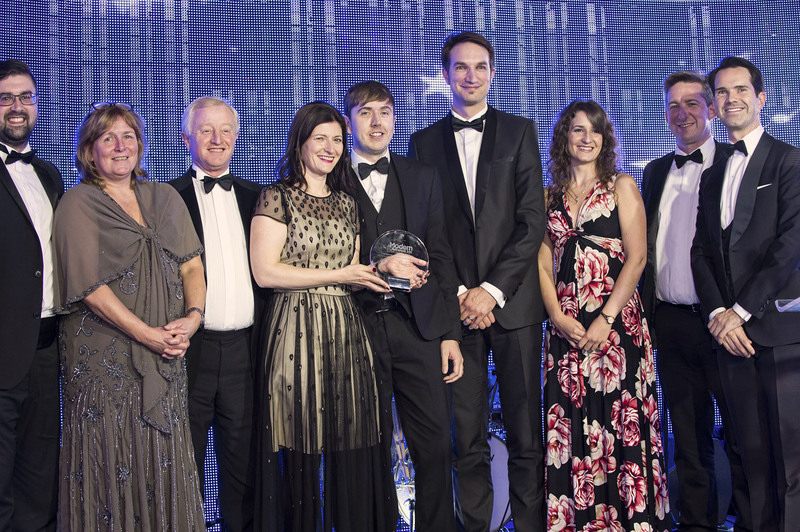 LawNet, the UK’s leading network of independent law firms, has won industry recognition for its ground-breaking work in re-shaping sector attitudes towards customer service excellence. 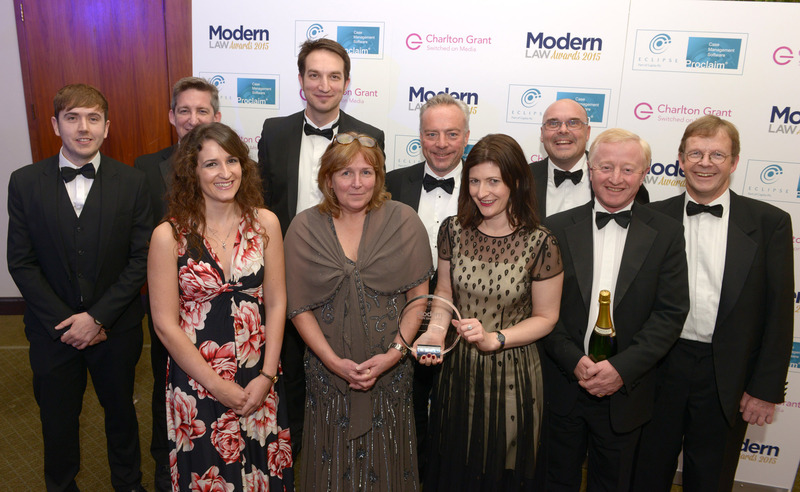 The network has been named winner of the 2015 Eclipse Proclaim Modern Law Award in the Supporting the Industry category. The accolade is in recognition of the impact of the LawNet Excellence Mark, which helps the network’s 67 independent law firm members to achieve and demonstrate consistently excellent client service delivery. The programme provides external measurement of the client experience to drive needs-based support and training, with firms using the results of regular mystery shopping and benchmarked client surveys to improve customer satisfaction. Earlier this year LawNet published a White Paper showing the learning from more than 25,000 client experience questionnaires and 1,100 mystery shops undertaken in the first two years across the LawNet community. “There’s been huge interest in the work we’ve been doing to support our members to provide excellent customer service,” said LawNet chief executive Chris Marston. 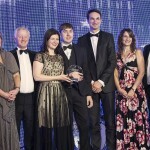 Pictured left to right: Ryan Cox of STL with the LawNet team : Nicolle Warren, Chris Marston, Helen Hamilton Shaw, Graham Ford, George Coombes, Felicity Towers, Peter Riddleston, and (far right) comedian Jimmy Carr. LawNet chairman Kim Carr added: “This is a well-deserved recognition of the work that the team at LawNet HQ has done to keep our network ahead of the curve. Practical support like this is part of the reason our membership numbers are growing. 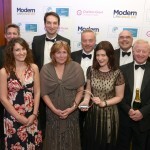 The Supporting the Industry award was in the category of organisations with up to 25 employees. 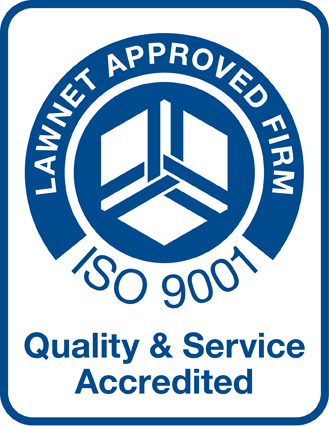 LawNet was established in 1989 to enable a collaborative, mutually-owned national network where independent law firms could access big firm resources and benefit from collective purchasing, shared knowledge, best practice and expertise. The combined income of the 65 firms comprising LawNet is currently in excess of £250m – equivalent to a UK Top 15 law firm – with members ranging from £2m to £20m turnover. Independent research shows LawNet is most highly valued by members for delivering in six key areas – training, networking, PII, practice development, marketing and compliance. It currently places over £1bn worth of PI cover alone for members each year, which helps stabilise premiums for firms.